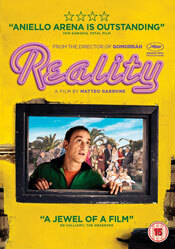 Dark Italian comedy from acclaimed director Matteo Garrone. The story follows Luciano (Aniello Arena), a Neopolitan fishmonger and family man obsessed with gaining fame and celebrity status. When his family suggest that he audition for the next Italian ‘Big Brother’ programme he throws himself into the project and begins to live his life as the character he wants to portray. As time passes and he awaits confirmation from the producers telling him he has gained a spot on the show, his own perception of reality begins to shift when he becomes increasingly convinced the cameras are already on him.